I love to sew, stitch pieces of fabric into quilts or shirts. To do that I have to use a needle. 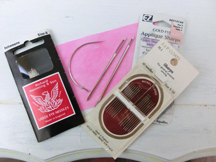 What many nonsewers are unaware of is--how many kinds of needles there are! 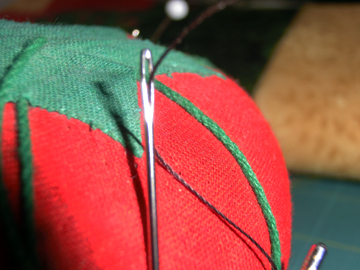 For hand sewing there are betweens, sharps, applique, darning, short, long and even curved ones used to repair a special stuffed animal or a rip in your couch. And the choices don't stop there. 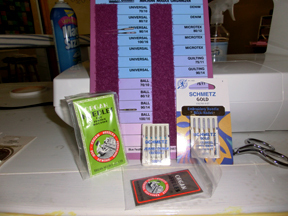 There are so many types of needles for my sewing machine that I need an organizer. Physical hurts are fixed with needles. Sorry no photos of that! I'm squeamish. Some needles are used to give us healing medicine or to check out blood levels. I have learned the easiest way to get thread through fabric is to use some Thread Heaven. 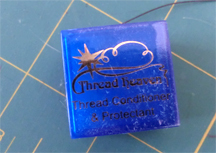 This stuff coats the thread helping it glide through tightly woven fabric making it easier to join edges together. The one thing I dislike about all needles is that they hurt when they stick in your finger. Too bad the Thread Heaven doesn't help with that. There's got to be a spiritual application in there...pain, needles, difficulty, Thread Heaven, smoothing it out and making it work. Well said, Rhonda. I was so tired when I posted I just didn't put in the spiritual part. Glad you caught it. I'm reading this think how the Lord can repair the tears and gashes that we allow to come into our relationship with Him. Sometimes the sewing is a little painful, but we are better off for action and endurance when the rends are brought back together. I read this thinking about the art of quilting and doll making and how I need to make time to do a little of both! Great post! So that's what the curved ones are for! I'm amazed by the way my needles disappear but pins are always underfoot. Now I know more on sewing needles! Now I know more on needles! Making time to quilt and sew is hard for me too. Sometimes I just sit in the middle of my 'stuff' and dream. Those curved needles are hard to use but what they fix --worth it! Mine disappear too, then I realized they were sinking into the pin cushion or just being absorbed in the mess of pins on the magnet pin cushion. I try to leave thread in them now so I can find them. Laury! I don't like mending or sewing on buttons. I've tried to think of it as editing but it doesn't work. Needles! What a creative take on the N post. I used to sew a fair bit, but haven't done any except for a bit of mending in a long time. I need to get back to work on my quilt! I find it hard to make energy for both writing and crafting, though. Sewing is "against my religion" and I tend to acumalate a pile of mending before I even consider the task. Shudder.